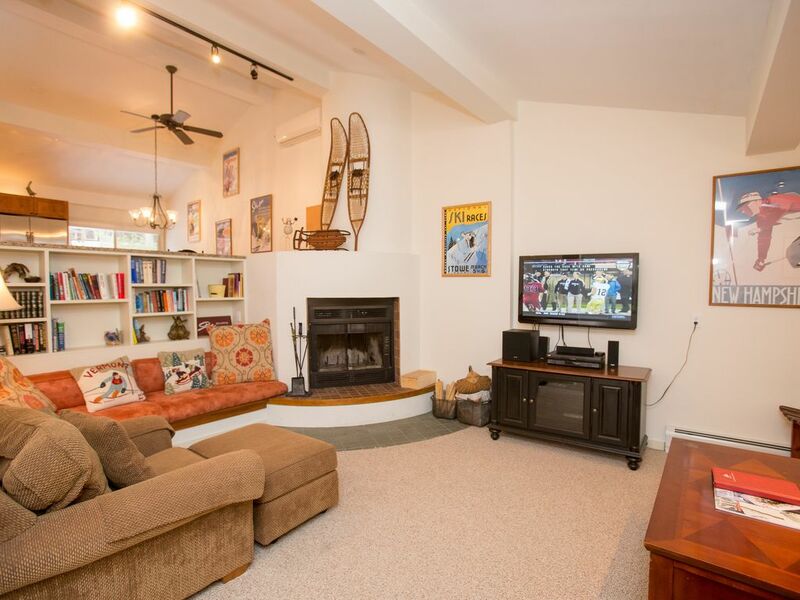 This multi-level four bedroom, three bathroom townhome features a fully equipped kitchen, spacious living room with fireplace, washer & dryer, and private ski storage outside of the unit. This townhouse was recently renovated, is modern and chic in appearance, and is the perfect getaway location for a large gathering of family and friends. Two bedrooms offer king beds, with a twin bed in the third bedroom, and two sets of bunk beds in the fourth bedroom. Additional guests can also be accommodated on the pull-out sofa in the living room. Private free parking and WiFi are included with your stay. Stowe Vacation Rentals offers a variety of lodging options in beautiful Stowe Vermont. Trusted by over one hundred homeowners, we offer rentals directly on the slopes of Stowe Mountain Resort, ski in ski out rentals at Stowe Mountain Lodge and The Spruce Peak Adventure Center, and along the Mountain Rd. Supported by 24 hour service we strive to make your stay as memorable as possible. We look forward to welcoming you to the beautiful mountain village of Stowe, Vermont. This unit is located within walking distance to Stowe Mountain Resort’s Toll House Chairlift (weather dependent, winter seasonal). In the summer months, enjoy the heated outdoor pool located within the Townhome community, as well as Stowe Mountain Resort's attractions, including the Auto Toll Road, ZipLine, TreeTop Adventure, and Stowe Rocks indoor climbing center. * Additionally, this condominium is minutes from the village of Stowe, restaurants, dining and Vermont favorite past times! *Some adventures/amenities are seasonal/weather dependent, and may require additional fees. The house was fantastic. The kitchen was huge with a table large enough to play games and have Thanksgiving dinner for 10. We loved having the fireplace that took the chill off when coming in from below zero temps. 4 bedrooms and enough bathrooms that no one had to wIt for showers. Stowe was beautiful and even though the weather was extremely cold most of the weekend we took advantage of the hills in the front yard to sled down the fresh 15” of new snow. We had a blast and want to return again to this excellent home beautiful city. You won’t be sorry renting this townhome! Very spacious common area, nice set-up for each bedroom, with bathrooms really close to each. Big table for dining. One should note-- the front door is down about a full story of steps from the parking area. They're shallow steps, so you can roll your suit-case down-- no problem for us-- but some may find that set-up undesirable. I had a great long weekend in this town house. It is no more than 200 yards from a chair lift. The unit is large, clean and cozy. The staff at the Inn were extremely helpful and nice. I would definitely stay here again. Thank you for taking the time to post your review of this townhouse. We appreciate your kind words and look forward to having you join us again. Thank you. Housekeeping Fees: A Departure Cleaning Fee is added to every reservation. A Mid-Stay Cleaning Fee of $140 is added to reservations of 5 nights or more. Optional daily housekeeping is available a la carte; please inquire upon making the reservation.